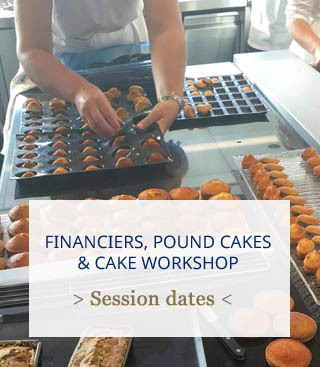 In August 2016, Clara Ciurana participated in her first workshop Financiers, Pound Cakes & Cake, she was conquered and decided to renew the experience. Clara has since realized two other workshops: Traditional Bread Baking - 2 days and the Secrets of the Macaroons. 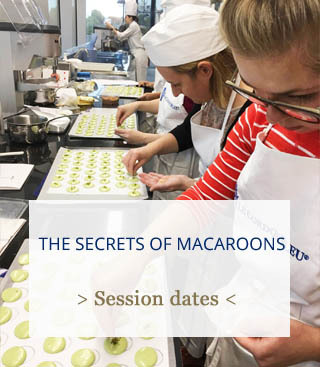 I joined Le Cordon Bleu workshops last August, concretely participating in 3, one based on Financiers, Pound Cakes & Cakes (6 hours), another one about Traditional Bread Baking (2 days) and the last one about the Secrets of Macaroons. In my case and also for the rest of people who are working, that´s a good option to learn about cooking with this kind of short courses, in weekend schedule. So you could improve your skills in cooking, pastry, bakery and enology lessons. In my case, I mainly love pastry so I focused in pastry & bakery workshops. I was really surprised because both courses were really amazing, you could cook following the instructions of the chef and learn a lot of recipes of pastry & bakery. The rhythm is very strong; it seems that you are working in a real company. In the course of pastry, we did 4 different recipes (Orange Pound Cake, Genoan Almond Sponge Cake, Traditional Small Almond Cake & Pistachio and Cherry Pound Cakes). 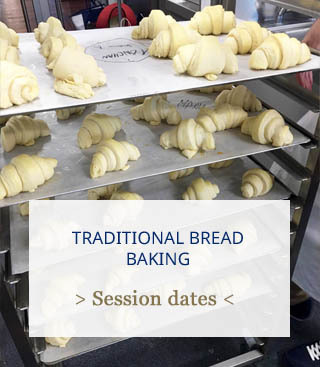 The 2 days of Bakery had the same quality & rh ythm, cooking up to 9 different types of recipes (breads, brioches and also croissants!). We have to cook White bread and “baguette”, Rustic Country-Style bread, French Tradition bread, Spinach Sandwich Bread, Whole Wheat Bread, Brioches, Croissants, Milk Bread Baguette & one recipe for make “Fougasse”, a special bread composed by olive and dried tomato. I didn´t know the old campus in order to compare with the new one, but I was really surprised about the current building. I know another cuisine schools but in my opinion, Le Cordon Blue has one of the best campus. The building is close the Eiffel Tower and in front of the Seine river, so you have an ultramodern school with an amazing view. The campus has 4.000 square meters with very well equipped rooms so it was really comfortable working there. The room of Financiers, Pound Cakes & Cakes took place close the lobby, on the right side and just in front of the Seine, so you could cook and enjoying the views. The Bakery course was done on the first floor, and also was really big and comfortable. One of the best experience´s was to work with people of other countries, so you could learn a lot regarding different ways of cooking. So the atmosphere was really international and enriching. My direct colleagues were from Paris and also from Vietnam, so it was really useful because they were always ready to collaborate with me. Regarding the Financiers, Pound Cakes & Cakes, our Chef Instructor showed us the different methods to create cakes, how to deal with the ingredients and where we can find them. My favourite recipe was the Pistachio and Cherry Pound Cake, based on Pistachio paste, really delicious! The Chef also showed us the way to make candied orange peel, in order to decorate the Orange Pound Cake, and other tricks of pastry. This workshop was really amazing because we made a lot of different cakes and I could improve my skills. I am absolutely a fan of Pastry and the chef was really open to inform us about the different methods and helped us when we have any problem. Regarding the Bakery Atelier, our boulangerie Chef Instructor, showed us the different ways for kneading bread and obtain Baguettes, Brioches, Croissants, White & French Tradition breads… He has a lot of knowledge so I was really exciting because it was my first time cooking bakery and when you finally see all the products that we made in the atelier I was really surprised. I had to make a party at night because it was impossible to eat all by myself! 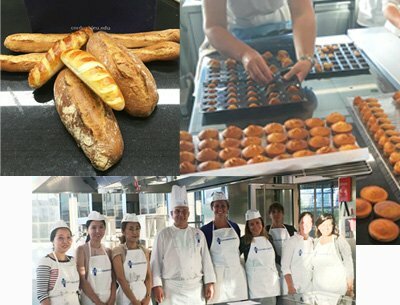 Learning in Le Cordon Bleu has been my best experience in Paris! The opportunity to learn with the best professionals Chefs and practice at the real time with them making your own products, and also the installations and international classmates, that´s a situation that I highly recommend for everyone! I feel like a student and the people who are studying for a long period there are very lucky. Yes, I have practise the Pistachio and Cherry Pound Cake for twice, and also the Orange Pound Cake, really delicious! 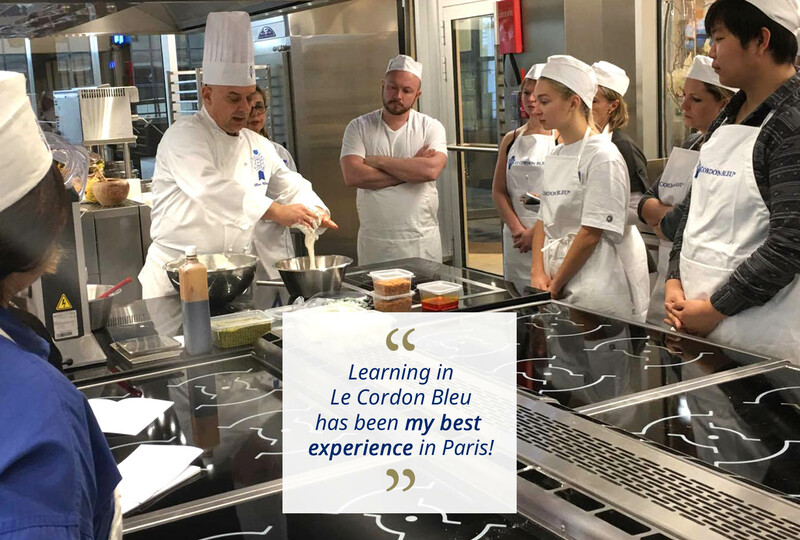 I noticed an evolution from my experience in Le Cordon Blue but I want to continue learning and improving my skills taking more workshops there. I am going to repeat the experience doing the Eclairs Workshop and also The Secrets of Tarts & The Secrets of Macaroons. I have the advantage to travel to Paris several times a year so I could continue learning at Le Cordon Blue.